Orange cup coral on the underside of the Town Pier in Bonaire. ORANGE CUP CORAL (TUBASTRAEA COCCINEA) HAS ALWAYS BEEN ONE OF MY FAVORITES. I’ve always liked its style – big, bold and dramatic. It’s what it is despite (or because of) the fact that doesn’t have the photosynthetic boost that helps reef-building corals thrive. That still holds. Not mentioned in the I.D. guides is an additional aspect – in the Atlantic/Caribbean/Gulf of Mexico basin, it’s an invasive species from the Pacific. The staff at Flower Garden Banks National Marine Sanctuary in the western Gulf, for one, is so concerned about its potential for taking reef space from native sponges and corals that they are actively trying to remove it wherever they find it. 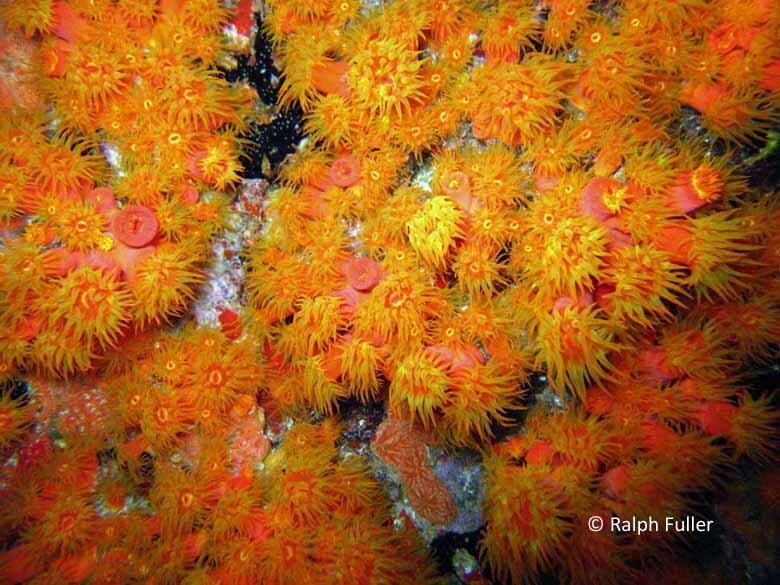 While orange cups aren’t a familiar, reef-building species like mountainous green star, they can show up as exuberant vivid patches of bright-orange corallites (or calcium carbonate cups) with yellow, fleshy tentacles extended to troll for the microscopic plankton in the current. The difference: Reef-building (“hermatypic”) corals can build up those mountainous structures because they have an advantage that orange cups don’t have – dinoflagellates, the photosynthetic algae that live in symbiotic relationship with them. While reef-building polyps do extend their tentacles to filter plankton for nutrition, they get most of their food – as much as 80 percent of it – and a reef-building boost from their photosynthetic friends. A cluster of orange cup photographed in the Galapagos – in the Pacific, where it’s supposed to be. Field guides tend to describe orange cups as “preferring shaded areas,” including the undersides of piers, ledges and caves. But the algae in hermatypics, photosynthesizing solar energy to create nutrition, means they seek sunlit locations in order to grow. I would suggest that, rather than preferring the underside of a ledge or pier, those are the places that orange cups and other ahermatypics can thrive without being out-competed by hermatypics. As a native of the Indo-Pacific basin, T. coccinea has a broad range, found in Madagascar, in the Red Sea, throughout the South Pacific and all the way to the Americas, from the Gulf of California to Peru. It was present in the Caribbean at Curacao and Puerto Rico at least by 1953, had spread into the Gulf of Mexico by 1977 and appeared in the Florida Keys by 1999. It was most likely brought into the Atlantic/Caribbean/Gulf basin attached or in the ballast water of ships. Orange cup coral corallites – closed up during daytime – on an oil platform piling near Flower Garden Banks National Marine Sanctuary in the western Gulf of Mexico. In the Atlantic/Caribbean/Gulf basin, orange cup has been particularly attracted to artificial substrates. It’s regarded a common coral in the Indo-Pacific, most often found in caves and under ledges. In the Atlantic/Caribbean/Gulf, it’s shown a propensity for settling on steel, cement and other artificial substrates, thriving on wrecks, piers, walls and oil and gas platforms. And, on reefs, enough to be troubling because of its potential for displacing sponges and native corals. Orange cup is a hardy invader – its larvae can survive drifting with the currents for as long as two weeks, giving it plenty of time to find new areas to settle. Once settled, it can begin reproducing within one and one-half years. Although in the Indo-Pacific it’s preyed on by several mollusks, a 2010 study found that it comes equipped with chemicals that deter most predators from dining on its fleshy tentacles and discourage other invertebrates from settling near it. Sort of like soap-on-a-rope, this colony of orange cup established a home on a rope hanging under an oil platform near Flower Garden Banks. The staff at Flower Garden Banks actively seeks to physically remove it from the reefs, although not from artificial structures. Note to well-meaning divers: Only sanctuary staff and others with permits are authorized to do so. They’d rather you just report where you’ve seen it. PRINCIPAL SOURCES: Reef Coral Identification, Florida, Caribbean, Bahamas, Paul Humann, Ned DeLoach; Coral Reef Animals of the Indo-Pacific, Terrence Gosliner, David Behrens, Gary Williams; “Tubastrea coccina,” National Exotic and Estuarine Species Information System; “Tubastrea coccina,” Global invasive Species Data Base; Invasive Cup Coral, Flower Garden Banks National Marine Sanctuary; “Chemical defenses against generalist fish predators and fouling organisms in two invasive ahermatypic corals in the genus Tubastraea,” (Abstract) Marine Ecology. Can’t resist adding that there is a very nice listing for T. coccina in the Idaho Department of Fish and Game Idaho Species website, although it does state that orange cup coral is not present in the state.